Provide comfort for the family of James Shelly with a meaningful gesture of sympathy. James Michael Shelly, 72, of Simsbury, beloved husband of Judith (Kalwarski) Shelly, died peacefully at home Wednesday, January 9, 2019. 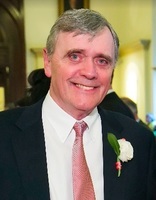 In addition to his loving wife of 42 years, Jim is survived by his daughter and son-in-law, Jill and John Sage, of Washington, DC; his daughter and son-in-law, Katie and Timothy Barrette, of Bristol; his son Jonathan Shelly, of Canton; his sister and brother-in-law Roberta and Theodore Sokolowski, of Long Valley, NJ; and three grandchildren, Josephine, Andrew, and Genevieve. He was known as Uncle Jimmy to cousins, nieces, and nephews. He was predeceased by his first infant grandson, Baby Barrette. Born September 6, 1946 in Belleville, NJ, Jim's parents were Nicholas John and Edith Roberta (Joiner) Shelly. He was a graduate of Rider College, Class of 1968, and, after earning his B.S. in Marketing, Jim worked 20+ fast-paced years as a senior sales executive. He served for several years as Vice President at global human capital management company ADP, responsible for a large sales team and strategic oversight of a 13-state zone. He, Judy, and their children lived in Long Grove, IL and Lincroft, NJ before they moved to Simsbury 26 years ago. Jim enjoyed life to the fullest and had a fantastic sense of humor that will be remembered by all who knew him well. A man of many nicknames, Jim cherished family adventures at the Jersey Shore and in Maine, as well as hiking, biking, tennis, and Saturday Night Live. He spent a lot of time outdoors, enjoyed watching sporting events of all kinds, and could beat anyone at Jeopardy. Jim's family will receive friends at Vincent Funeral Home, 880 Hopmeadow Street in Simsbury, Friday, January 18th from 9:00 AM to 10:30 AM, followed by procession to St. Catherine of Siena Church for a Funeral Mass of Christian Burial at 11:00 AM. The Burial will be private. 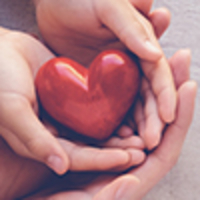 In lieu of flowers, memorial donations may be gifted to The Heart Center at Boston Children's Hospital: http://giving.childrenshospital.org/. Please visit Jim's Book of Memories at www.vincentfuneralhome.com for online tributes. 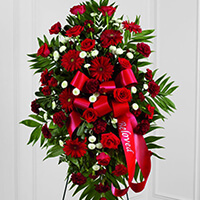 Love, Stephen & Laura sent flowers to the family of James Michael Shelly. Hello Judy - my name is Frank Teterus and my wife’s name is Pat. Once a week we met up with Jim in the bar at Bertucci and we always looked forward to our evenings together. I cannot tell you how much we will miss him nor can we tell you how much we enjoyed his great company. If he ever mentioned us, I’m the guy from Oklahoma. Our thoughts are with you and yours. To Judy, Jill, Jonathan, & Katie, Our deepest sympathy. Love, Stephen & Laura purchased the The FTD Treasured Memories Standing Spray for the family of James Shelly. In loving memory of Jim Shelly. I am so sorry you all are going through so much. This foundation is a cause that I’m sure meant a lot to Jim.